Book – Fiction. By James W. Russell. 2012. 210 pages. 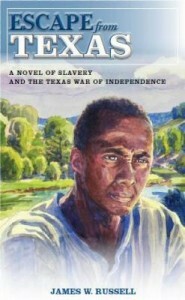 Historical fiction about the years leading up to the Texas War of Independence, based on the story of James Robinson, an enslaved man who fights for his freedom. In 1828 James Robinson, an enslaved man arrives in Texas, brought by his “owner,” Samuel Bingham. Texas was then a part of the Mexican state of Coahuila y Tejas. James comes to Texas because he has no choice. But once there, he finds a post-revolutionary country where slavery is on the way out and his freedom is a real possibility. Bingham is determined to take advantage of the low cost of land in Texas to build up a farm into a cotton plantation with the use of slave labor. Over the next nine years, James will experience and participate in a series of wrenching events that marked the origins of the Lone Star State. Set in the years surrounding the 1836 Texas War of Independence, Escape from Texas is a solidly researched examination of the clashing aspirations of people who are enslaved, slave owners, Indians, and Mexicans during a turning point of the westward expansion of the United States. ISBN: 9781597380355 | Published by Sloan Publishing | www.escapefromtexas.com. I agree with James because the people that were brought from Texas were now Under the Command of General Jose.